This 9ct yellow gold diamond eternity ring features 1/2 carat of brilliant cut diamonds set between claws, making for a stunning anniversary gift. 9ct Yellow Gold 1/2ct Diamond Eternity Ring is rated 3.7 out of 5 by 3. 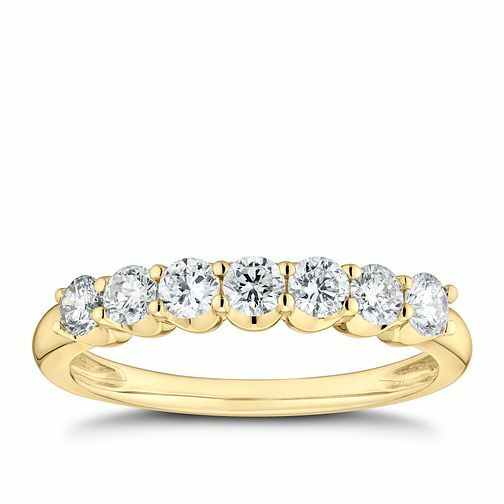 Rated 5 out of 5 by Anonymous from 9ct yellow gold diamond eternity ring What a beautiful ring to give to my partner she loves it. It is light and stunning all her friends and customers notice it straight away and remark on its beauty and elegance. Rated 1 out of 5 by Anonymous from Diamond fell off and lost Good looking ring but diamond fell off and lost after just a few days.